In late November, graduate students from the M.Sc. Marketing, M.Sc. 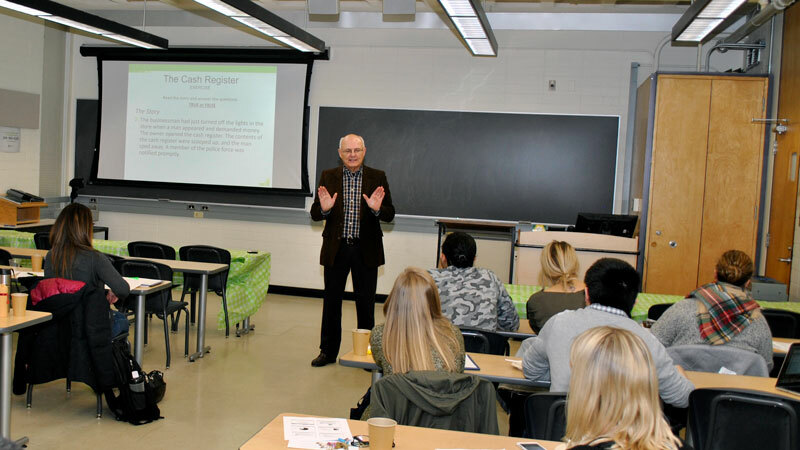 Finance, and MBA programs at Edwards School of Business participated in an experiential learning initiative. Experiential learning is incredibly valuable to students who wish to gain real-world and applicable experience that is not always gained in a traditional classroom setting. The inspiration for the professional development workshop arose out of conversations with graduate students where a skill-building opportunity was recognized. Providing students with the resources they need to participate in meetings, effectively network, attend competitions, or collaborate with partners is a foundational skill both within and outside of their field of study. This particular initiative was a joint project between the Edwards Grad Programs Office and Edwards Career Services. The focus of the workshop was on leadership and communication and was facilitated by Bruno Konecsni. Now working as a consultant, Bruno is the former Senior Human Resources Director at the University of Saskatchewan. His activities are focused on personal effectiveness, leadership, alternative dispute resolution processes and developing collaborative workplace relationships. Following the workshop, Maryann Ross of Edwards Career Services led a panel featuring Vince Bruni-Bossio, Gary Mearns, Lee Swanson, and Bruno Konecsni. The panel shared stories from the field and participants left armed with strategies to be successful as a graduate student, researcher, and as a professional across a range of settings. For more information on Edwards School of Business graduate programs, please visit edwards.usask.ca.